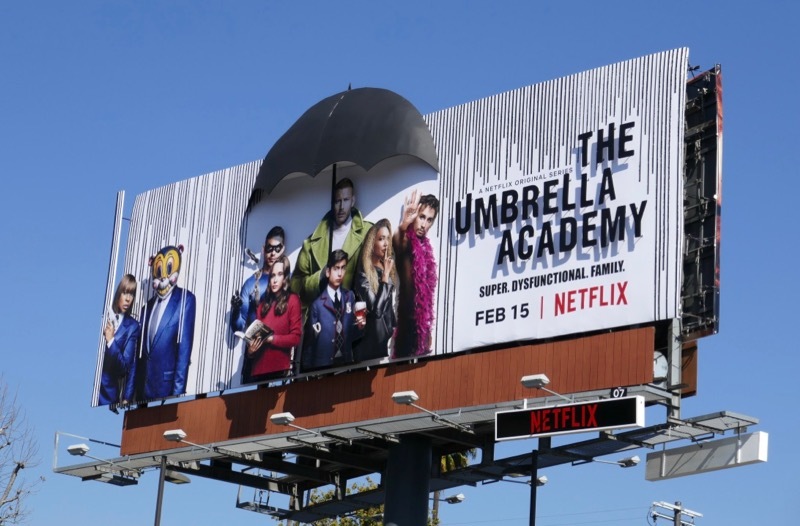 With the weather turning rainy once again in L.A., it seems like the perfect time to shine a spotlight on Netflix's new comic book adaptation of The Umbrella Academy. 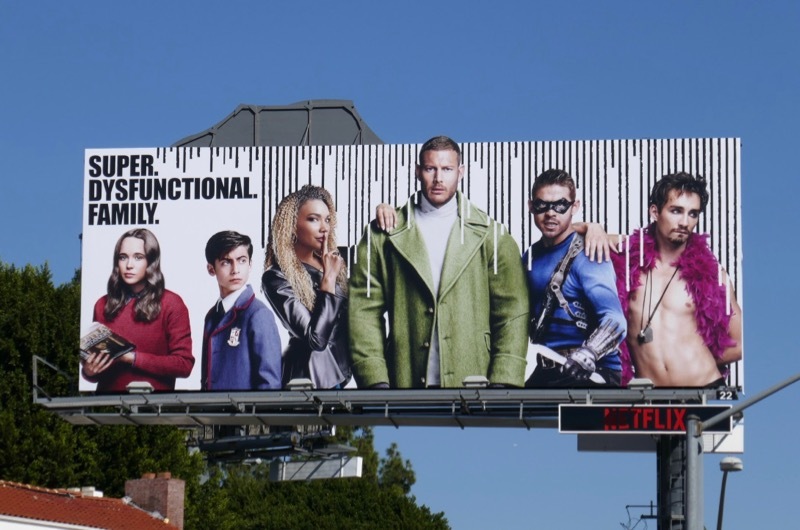 The Dark Horse Comics series was created by writer and My Chemical Romance frontman Gerard Way and artist Gabriel Bá in 2007 and follows a dysfunctional family of superheroes, raised by an eccentric guardian and mentor, who have to come together years later to solve their mystery of their dad's death and prevent an impending apocalypse. 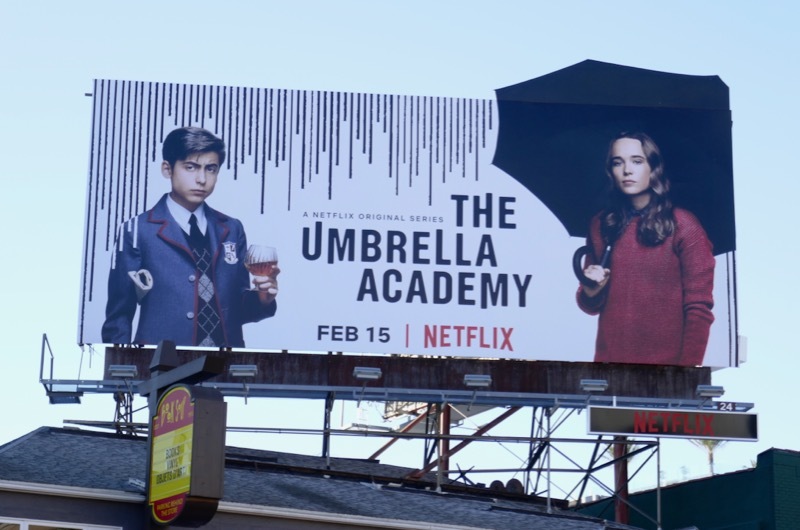 The TV series begins in October 1989 when one day 43 babies are mysteriously born to women who weren't pregnant at the beginning of the day. 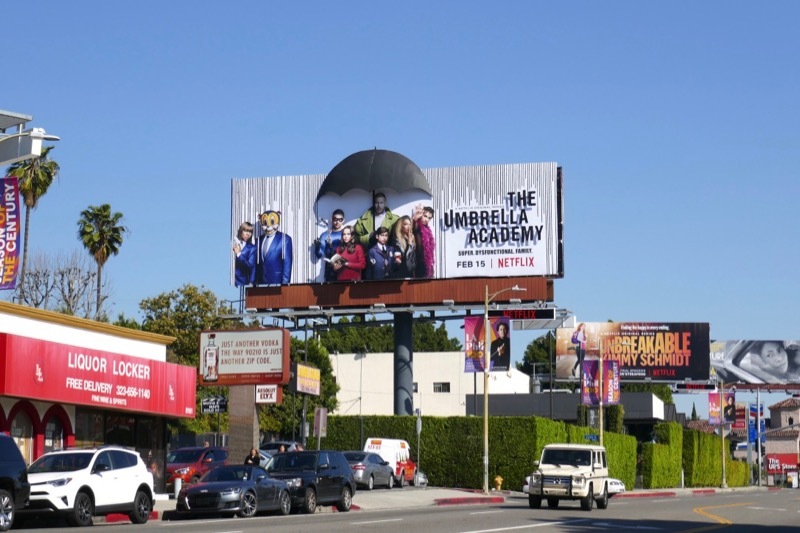 Each child possesses a unique ability and billionaire-with-a-secret 'Sir Reginald Hargreeves' aka 'The Monocle' (played by Colm Feore) adopts seven of these gifted kids, names them and trains them in their powers as his academy. 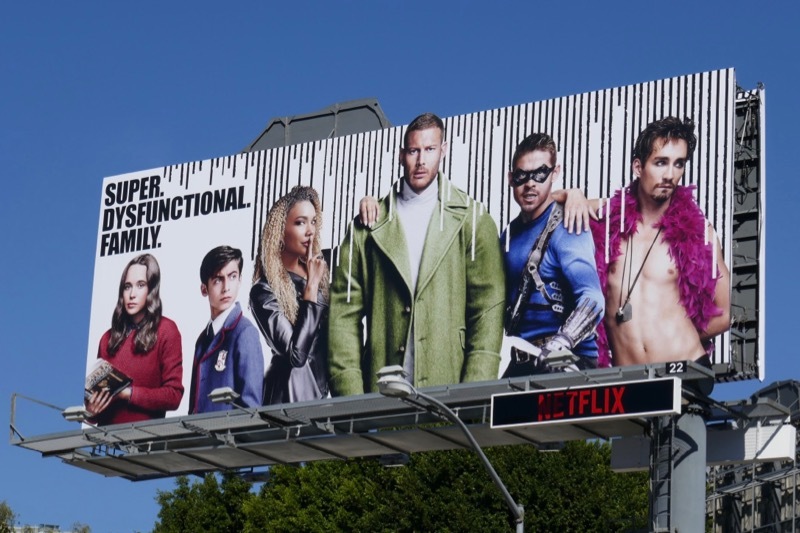 Tom Hooper plays the super-strong 'Luther/Spaceboy', David Casteñada plays skilled weapon-wielding vigilante 'Diego/The Kraken' who can hold his breath indefinitely, Emmy Raver-Lampman plays 'Allison/The Rumor' whose lies change reality, Robert Sheehan is 'Klaus/The Séance' the telekinetic who can talk to the dead, Aidan Gallagher as the time-traveling 'The Boy/Number Five' who got stuck in the future and aged mentally whilst his body didn't, the deceased 'Ben/The Horror' and Ellen Page is 'Vanya/The White Violin' who's seemingly powerless but really likes music. 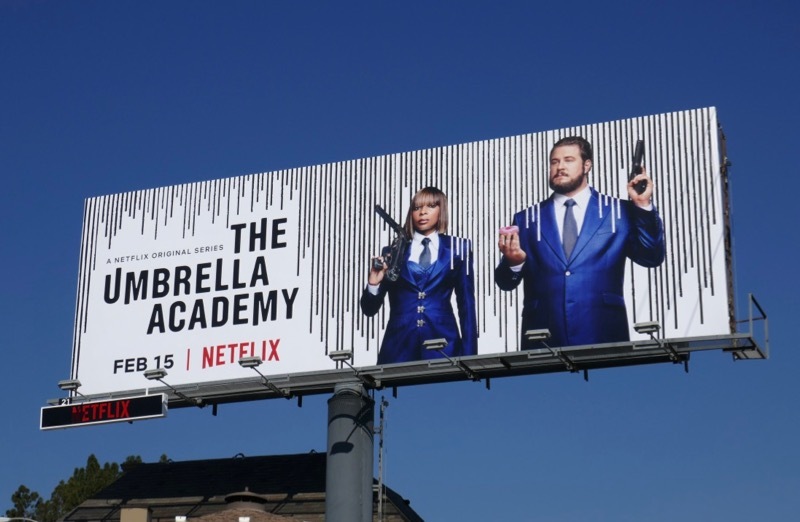 In the series the Hargreeves siblings will face the mask-wearing assassins 'Cah-Cha' (played by Mary J. Blige) and Cameron Britton's 'Hazel' trying to thwart their attempts to stop the apocalypse. 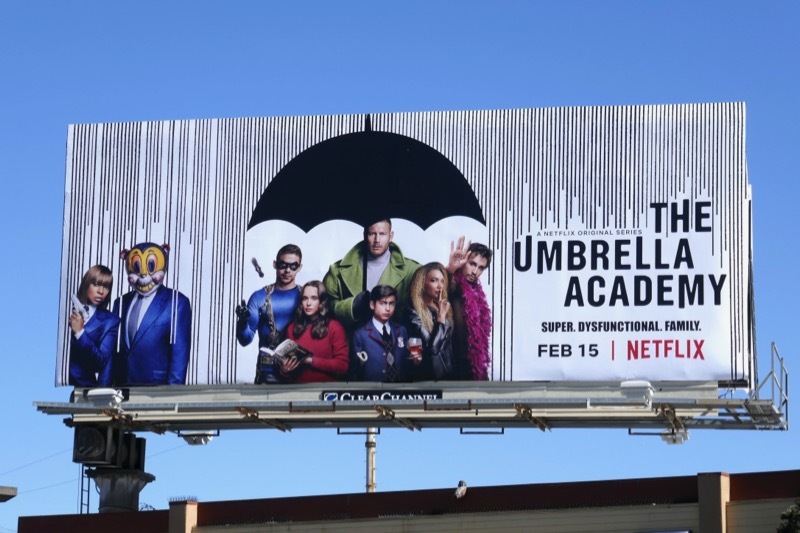 This impressive collection of series launch billboards were snapped along Pico Boulevard and the Sunset Boulevard from February 6 to February 8, 2019. 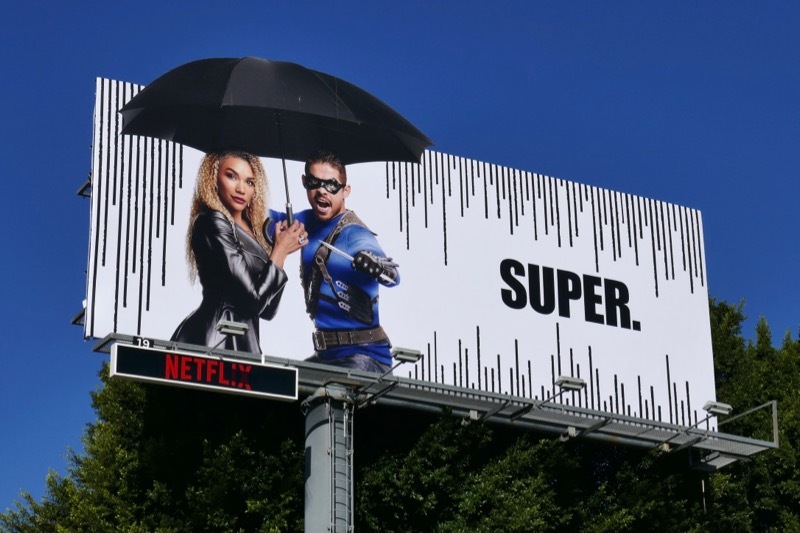 The extra-dimensional 3D billboard and the consecutive special extension umbrella-themed cut-outs really make a fantastic spectacle in Netflix's newly acquired ad sites along the Sunset Strip. 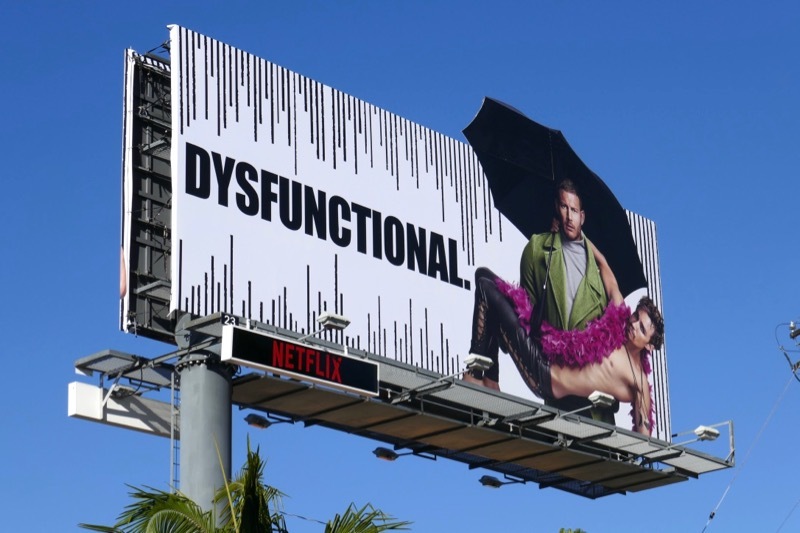 Fans of Ellen Page can also check out this Gaycation billboard, whilst for more Mary J. Blige be sure to also check out these Mudbound movie billboards. 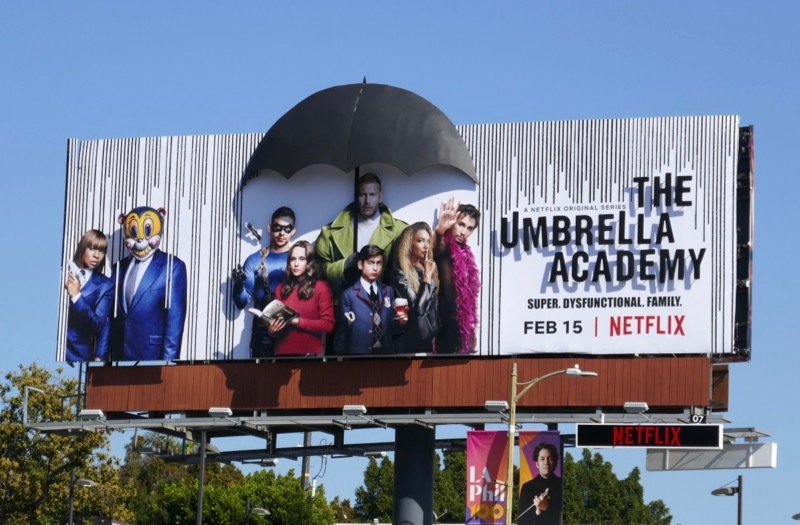 Comic book adaptations are always tricky as there's that balance of satisfying die-hard fans and translating the concepts to entertain a wide audience, so let's see if Netflix subscribers will fall in love with The Umbrella Academy this February. 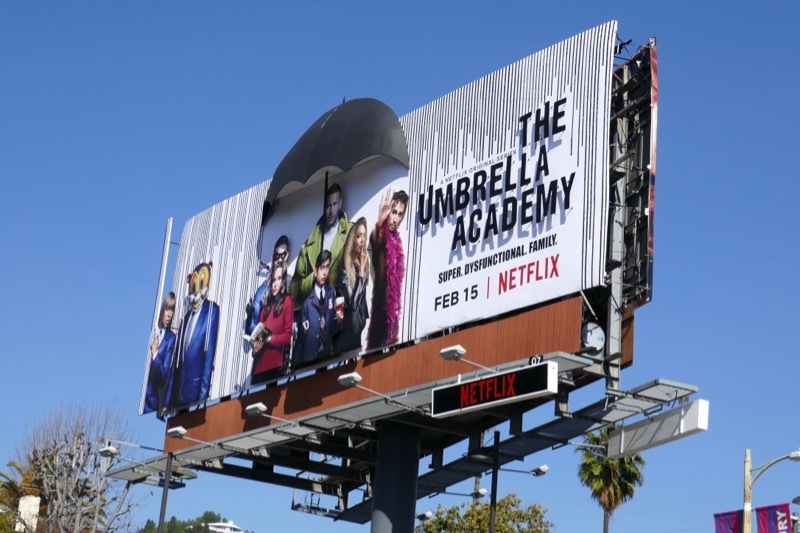 One thing's for sure, when trouble reigns for this dysfunctional family, it pours.